The 57th District of the Virginia General Assembly represents Charlottesville and portions of Albemarle County. The General Assembly is a bicameral body consisting of a lower house, the Virginia House of Delegates, with 100 members, and an upper house, the Senate of Virginia, with 40 members. Combined together, the General Assembly consists of 140 elected representatives from an equal number of constituent districts across the commonwealth. Help cvillepedia by improving this article with information about 57th House of Delegates district Virginia House 57th district from wikipedia. 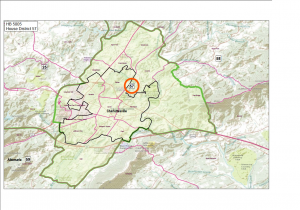 The fifty-seventh state house district includes: All of the City of Charlottesville; and part of Albemarle County comprised of the Agnor-Hurt (104), Branchlands (103), Cale (405), Dunlora (105), Georgetown (203), University Hall (202), and Woodbrook (101) Precincts and parts of the East Ivy (304) and Free Bridge (504) Precincts. As of the 2010 census (HB 5005 Passed 4/28/11), a total population of 80,778 (target 80,100) resided within Virginia's fifty-seventh state house district. No independents or Republicans have announced whether they will run. ↑ Web. Prof. Sally Hudson challenges David Toscano for House of Delegates seat, Jake Gold, News Article, Cavalier Daily, December 4, 2018, retrieved March 8, 2019. 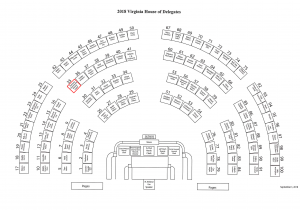 The Virginia House of Delegates District 58 represents portions of Albemarle County as well as parts of Fluvanna, Greene, Orange and  Rickingham Counties.